Mr. President, Sir, with all due respect. Do you believe all Americans have a commitment, duty and moral responsibility to protect from harm our nation’s most valuable and cherished assets, many currently experiencing our nation’s generational Cycle of Child Abuse, Neglect and Maltreatment that evolved from America’s long-standing, ignorant Culture of Racism? Specifically, sir, I am referring to Americans like your friend American Urban Storyteller Kendrick Lamar. An admittedly emotionally ill American traumatized by gun violence he witnessed at the tender age of five-years-old, outside the home where he, his siblings, and numerous cousins, as well as neighborhood friends had a right as well as absolute human need to feel SAFE, loved and cared for during a critical period of their human/childhood development. Mr. President, sir, with all due respect, it’s apparent your good friend Kendrick, who more than once has publicly revealed he’s been experiencing acute depression as well as Suicidal Thoughts for much of his life, is experiencing some type of emotional or mental illness. Illness directly related to the Childhood Trauma he experienced being raised by family members experiencing some type of emotional illness preventing them from embracing and following their innate, natural human urge to place their child’s emotional well-being Above All Else, as well as their instinctual human need to protect their child from harm. Sir, in addition to sharing a covenant with our nation’s protectors, do we not have a covenant and Duty to protect from harm young Americans so they may mature into reasonably responsible, fairly or wonderfully happy American teens and adults embracing genuine concern for the future of our nation? I grew up in the sixties listening to virtually all of my American neighbors of African descent showing off their musical skills and talents by creating and sharing beautiful American art all Americans can and should be proud of. Everyday of my young developing life I had the privilege of witnessing mega-talented American musicians/storytellers sharing original American artistry admiring, praising, adulating, wooing, lamenting, loving and respecting American women and teen girls. For years I, as well as most all my neighbors enjoyed smiling, boogieing and singing along with Americans of African decent sharing words of Peace, Love & Understanding. Music artistry composed and shared by my American neighbors of color influenced and convinced young me they are peaceful, loving, cool, talented, gifted Americans with the skills to make me and my neighbor’s dance, smile and want to celebrate life. Drugged up or not, there are no excuses for this woman’s ignorant, rude, outrageously MEAN behavior. 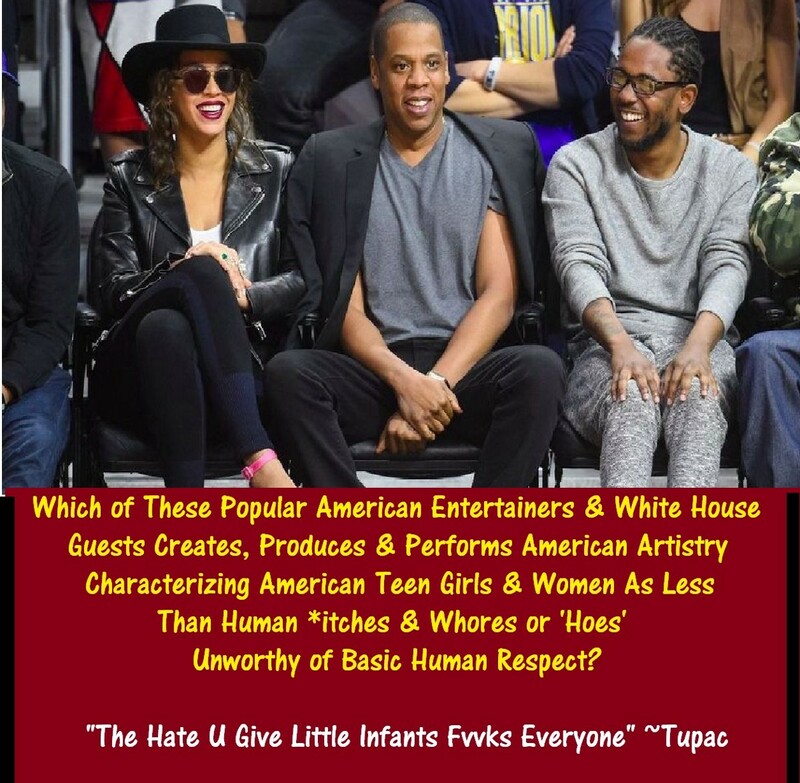 Though judging by her age it is evident she grew up listening significant numbers of American of African descent creating popular American music characterizing her, as well as other American teen girls and women as less than human ^itches and ^hores unworthy of respect. 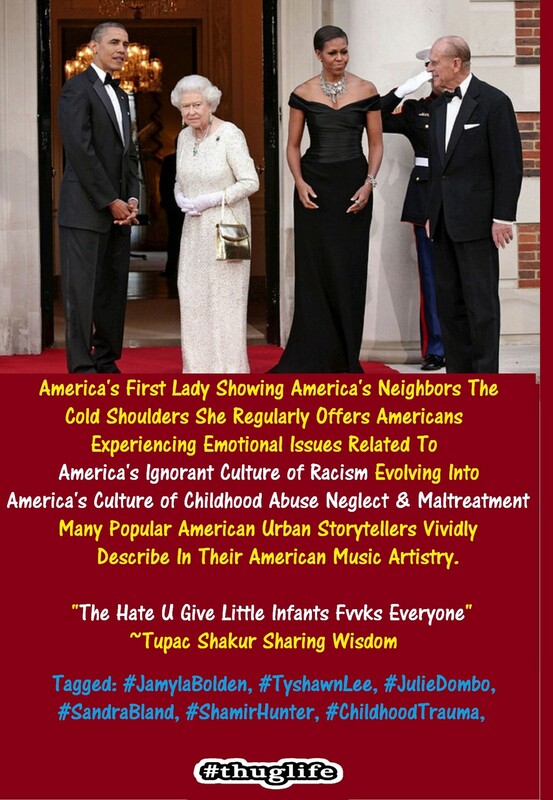 As a child and teen this seemingly emotionally disturbed woman, her family and friends listened to significant numbers of popular African American music performers and urban story tellers vividly describe witnessing or personally engaging in ‘people and community’ behaviors that most all well adjusted Americans and human beings find grossly offensive as well as frightening. Unfortunately, this woman as well as millions upon millions of Americans fail to recognize that America’s ignorant Culture of Racism has evolved into a “Culture of Child Abuse, Emotional Neglect/Abandonment, Maltreatment, Emotional or Mental Illness” responsible for American urban storytellers like the late Tupac Shakur or the currently popular Kendrick Lamar creating American art describing American women and teen girls as less than human creatures unworthy of human respect. The same Culture of Childhood Abuse and Neglect responsible for Kendrick and Tupac, as well as many other urban storytellers speaking about experiencing acute depression and Suicidal Thoughts throughout much of their lives. High on drugs or not, there are NO EXCUSES mitigating this woman’s nasty and mean behavior. Just as there are no excuses for millions upon millions of my responsible, caring, loving American neighbors ignoring the fact that significant numbers of American newborns, infants, toddlers, children and teens are being raised, nurtured, socialized and supervised by a significant population of maternal caregivers experiencing some type of emotional issues or illness preventing or impeding them from embracing and following their innate natural urge to protect their child from harm, as well as placing their child’s emotional well-being ABOVE ALL ELSE!!! To learn how CHILDHOOD TRAUMA, OUR NATION’S # ONE HEALTH disease/condition impacts the lives of far too many Americans, please begin by listening to Dr. Robert K. Ross’ 13:00 presentation posted on YouTube’s Tedx Channel. Michelle & Barack Obama — I Absolutely Adore America’s Beautiful, Responsible “Cool” Presidential First Couple.